Coach Barry Trotz says he has no problem with captain Alex Ovechkin's assertion that the Washington Capitals will eliminate the New York Rangers in the second round of the playoffs. 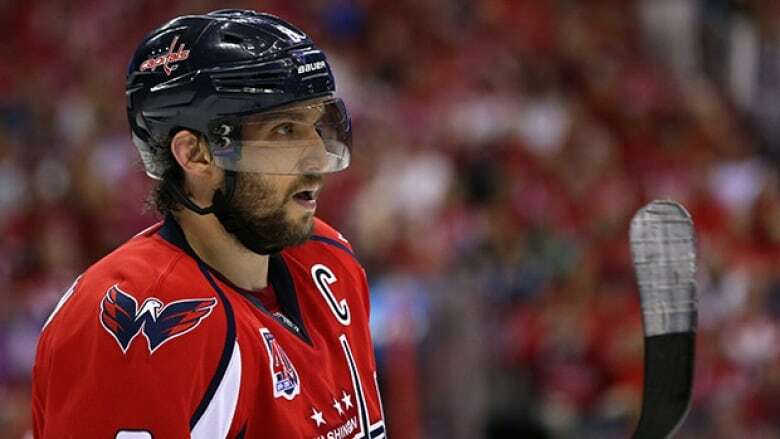 Alex Ovechkin certainly can talk the talk, from his "All series, baby" jab aimed at Henrik Lundqvist during Game 1 of their Eastern Conference semifinal, to his assertion that the Washington Capitals will eliminate the New York Rangers in Game 7. And Capitals coach Barry Trotz is absolutely fine with his captain's bravado. "His whole career, he's said stuff," Trotz said at the team's practice facility on Monday, a day off for the players. "Every year, he says stuff that [is] bold — and he backs it up, usually." After New York held off a rally to edge Washington 4-3 Sunday night and force a Game 7 at Madison Square Garden on Wednesday, Ovechkin said: "We're going to come back and win this series." Moments later, the three-time MVP and five-time NHL goal-scoring champion added: "We're going to play our game and we're going to come back and we're going to play Montreal or Tampa," a reference to the possible opponents in the conference final. Trotz continued: "I mean, come on. What do you expect a player to say? I love that. I love that a player has got the wherewithal to say, 'Hey, we're going to go there and we're going to go after them and we're going to leave it out there.' ... That's the mindset you need to have. If you don't have that, you might as well pack your bags." After scoring in Washington's 2-1 victory in Game 1, Ovechkin skated behind Lundqvist's net and told him, "All series, baby! All series." Ovechkin scored again in Game 2, but not since, as the Capitals have let a 3-1 series lead disappear by losing consecutive games for the first time in nearly two months. The Russian left wing, whose 53 goals led the league, only had one scoring drought all season that was longer than his current four-game rut — a six-gamer from Oct. 18 to Nov. 1, more than half a year ago. His linemate, centre Nicklas Backstrom, led the NHL in assists and finished sixth in points, but he has zero goals against the Rangers. This will be the ninth time in that duo's 11 career playoff series that Game 7 was required. The Capitals have gone 3-5, including a pair of losses to Lundqvist and the Rangers in 2012 and 2013. After Sunday's loss, the Capitals insisted they were encouraged by having scored a pair of third-period goals after trailing 4-1. Ovechkin took that a step further, saying about the Rangers: "They're afraid, because we're big and strong and you can see how we score goals. We just put bodies in front of Lundqvist and it goes in." Since 1985, the Capitals have managed to lose nine series in which they led 2-0 or 3-1. When the topic of the franchise's past playoff stumbles was raised, Trotz offered a sampling of what sounded like a pregame motivational speech. "I don't see a Stanley Cup banner here, yet. So history — you have to make your own history," Trotz said, sprinkling in a reference to the Boston Red Sox ending their 86-year wait for a World Series title in 2004. "I was reading some stuff. Our record's not very good as an organization. True. Absolutely true," he said. "But we can change that. I would think, just looking at some of the numbers, the odds are in our favour right now, right?"